What would it be like in an era when music and astronomy were sister sciences? According to the ancient Pythagoreans and many later writers, all of nature is a musical scale. 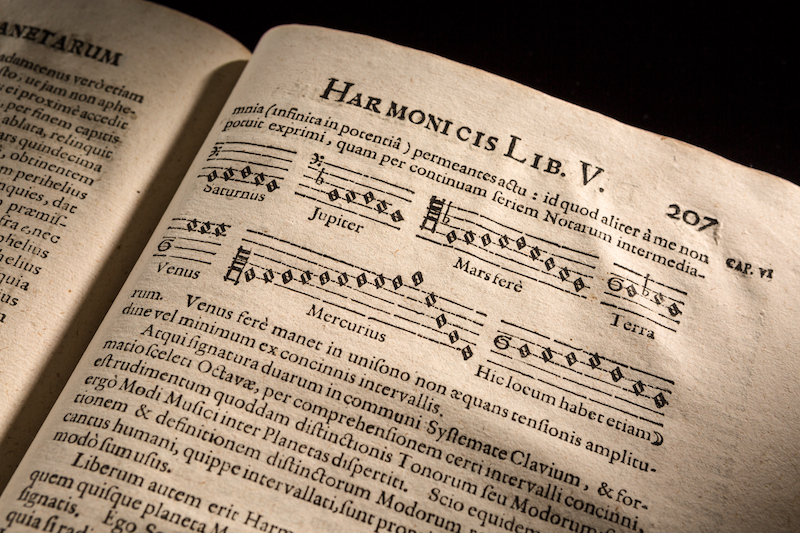 Music illuminated the study of astronomy, while astronomy provided a context for understanding music. The study of astronomy, music and mathmatics were deeply related in Galileo’s world. Galileo’s father, Vincenzo Galilei, is credited as one of the founders of the Italian opera and a major contributor to music theory. In the Earth-centered model of the universe accepted during the Renaissance, a spherical Earth lies in the center surrounded by the regions of earth, water, air and fire. Rotating heavenly spheres, nesting one within the other from the Moon all the way out, carry the planets and stars. As these solid celestial spheres turn in place, their harmonious motions create the music of the spheres from which Johann Kepler formulated the harmonic law of planetary motions. You are currently browsing the archives for the Mathmatics category.